Manatee mother and her young. Recent cold fronts have very high numbers of manatees concentrated in warm-water refuges in the Orange River, Mullock Creek, Estero Bay and other inshore areas of Lee County. The Florida Fish and Wildlife Conservation Commission (FWC) asks boaters to be on the lookout for manatees in warm-water refuges, and as temperatures moderate, in main channels. Boaters should slow down and comply with posted speed restrictions in manatee protection zones. 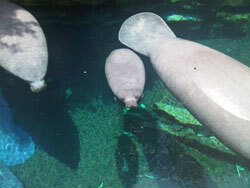 In the Orange River area, manatees will move into the Caloosahatchee River and, from there, into feeding areas in Matlacha Pass and San Carlos Bay and other inshore waters. Manatee concentrations have also been reported in Mullock Creek and Estero Bay near Lovers Key. “To avoid striking manatees, vessel operators should wear polarized sunglasses to help them spot the creatures in the water, and watch for the large, telltale, circular slicks on the surface of the water (manatee footprints) that indicate the presence of manatees,” said Carpenter. All member agencies of the Lee County Marine Law Enforcement Task Force will be increasing patrols and enforcing manatee-protection-zone speed limits to aid the animals during this period when they are most vulnerable to vessel strikes.